I love bacon. I mean absolutely love bacon. and Chocolates, well who doesn’t love chocolate? So when I found the Baconery I was naturally thrilled. These guys bake with bacon. Yes that’s what I said. Check out these truly unique snacks I was sent to try out. 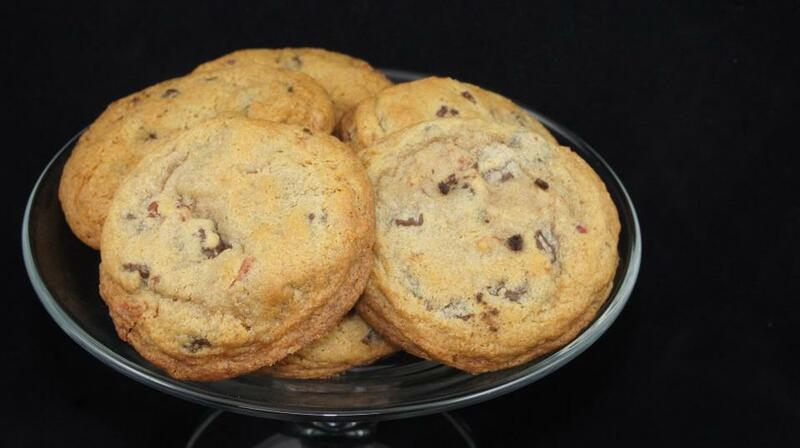 A Chocolate and Bacon cookie deserves Haiku, or maybe some other Romantic stanzas of poetry. Maybe we’re over thinking it, and a limerick will do just fine. There once was a cookie from Dublin, that got my stomach a-rumblin… Maybe I just need to eat a few of these. Thick sliced bacon compliments the chocolate well. Wouldn’t think it would go together, but it is amazing. Really, who would think bacon and chocolate would go together? Delicious. Pretzels love bacon, just like they love mustard and cheese. 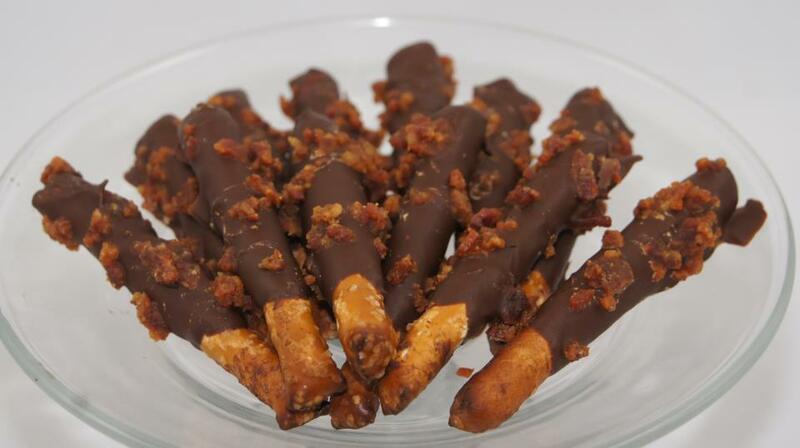 When Pretzels and Bacon fall in love, they like to take trips to the country to go swimming in lakes made of chocolate. Luckily, chocolate is awfully hard to wash off. Yum, just yum. 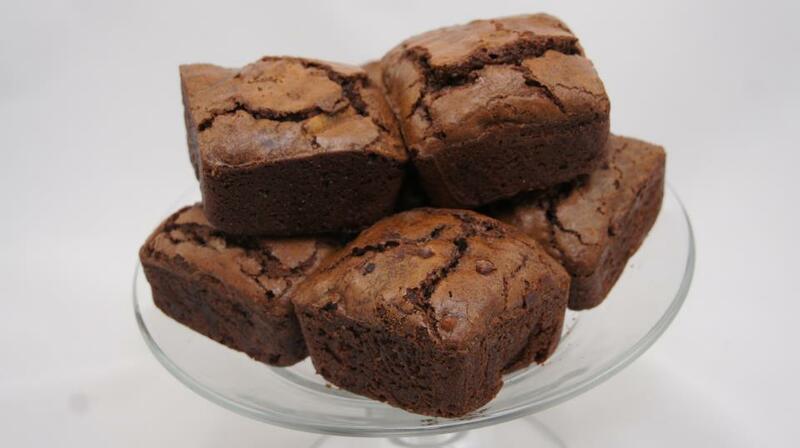 Crumbly, yummy brownie is sweet, and salty with bacon, velvety and would go well with a glass of milk. You can add anything to a brownie, but it’s still a brownie. It’s chocolate, chewy, and decadent. Bacon is flavorful, salty, and decadent. See, they share the decadence! It works, just admit it and give in. Everyone’s favorite. 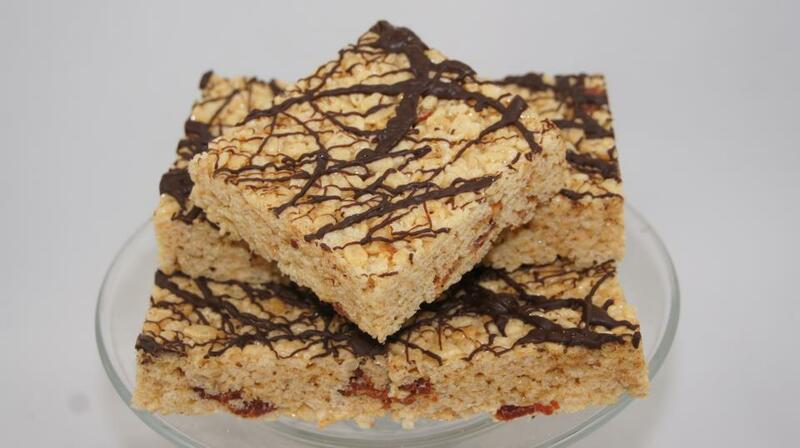 Sweet treat mixes bacon with rice cereal, marshmallows and chocolate. totally tasty. It’s like a Marshmallow Bar, that same buttery, chewy, crispy bar. It’s changed somehow. Why would we mess with perfection? You may have not known there are actually 5 levels of perfection. The addition of pork brings this treat to Level 4. Level 5 is secret. Want to keep up with all things Baconery? You can like em on Facebook, follow em on Twitter, and sign up for their newsletter. Ready to buy? 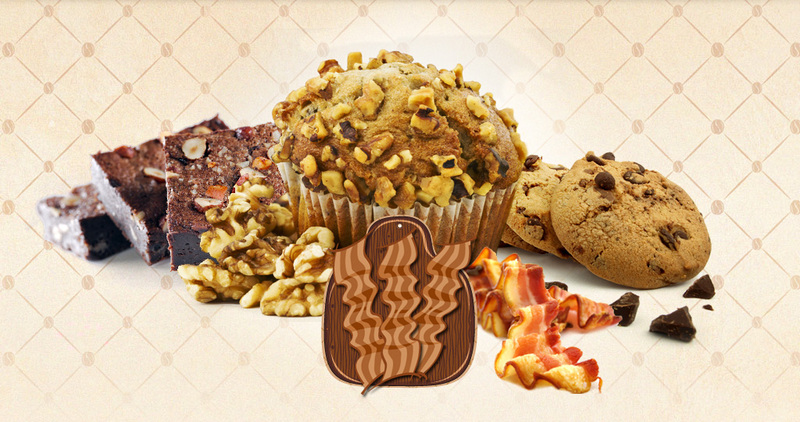 Head on over to Baconery and get ya some of these truly unique treats. Check out their Menu here. I was sent an Earth Box to check out. I have been wanting one of these for awhile so I was really excited to get a chance to review one. I got to pick what color I wanted and I went with Terracotta. Earth Box is a wonderful way to container garden. I love that the Earth Box is so simple to set up. No weeding, no tilling. Earth Box waters from underneath so there is no worrying about fungus that can be brought on by watering from above. This is particularly a problem with melons and squash. We are fixing to move to town and I dreaded the prospect of not having a garden anymore.n. With Earth Box it’s possible to have fresh vegetable, herbs and berries in town. You can even use Earth Box on the balcony or roof of your apartment building. I am really looking forward to being able to garden in a whole new way. I think Earth Box is great for those who are getting a little older and not able to til, weed and do the digging it takes for traditional gardening. Earth Box is a great gift idea for everyone. You can teach your kids about growing food. You can grow your own herbs for those who enjoy the culinary arts. 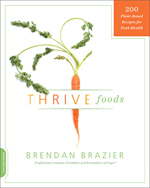 Fresh foods are so much higher in nutrients than store bought fruits and veggies. And the flavor, don’t get me started on the flavor. With Earth Box you can be sure what is in your food. If you want to grow organic you can without wondering if your food is truly organic. Terracotta EarthBox Container Gardening System G-R-O-W…Grow, Grow, Grow! That’s exactly what your plants will do in an EarthBox®! Poor soil conditions and small backyards are no match for the EarthBox®. Now it’s easy to garden anywhere–even on balconies, porches, and rooftops! 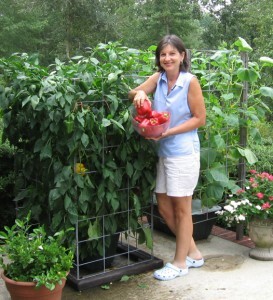 Anyone can enjoy delicious homegrown veggies, fruits, and herbs grown in an EarthBox®. A sustainable product that uses less water and fertilizer, the EarthBox® will grow bigger and tastier plants faster than a conventional garden–with virtually no effort and zero guesswork! Great results, no matter what color your thumb is. Kit Includes: 1 EarthBox® container, 1 aeration screen, 1 water fill tube, 2 reversible B/W mulch covers, and instruction sheet. All plastic components are durable, food-safe, and UV-stabilized. Container holds 2.0 cu. ft. of growing media, and reservoir holds 3 gallons of water. Measures 29″L x 14″W x 11″H. Integrated caster sockets. Choose from Green, Terracotta, or White. Each EarthBox includes our One-Year Satisfaction Guarantee. Items shipped to AK, HI, Guam, VI and other US territories are delivered by Parcel Post and charged at our 2nd Day Air shipping and handling rates. For customers wishing to ship orders to APO/FPO addresses via Parcel Post, please call Customer Service at 1-800-821-8838 between 9:00 a.m. – 5:00 p.m. EST, Monday through Friday. We regret that we cannot ship to foreign countries. Want to keep up with all things Earth Box? You can like em on Facebook, follow em on Twitter, sign up for their newsletter and subscribe to their YouTube channel. Earth Box will soon have their own blog. Ready to buy? Head on over to Earth Box and get ya some of these awesome planters. They even have a catalog you can order. Cloud 9 World sells an amazing line of children’s books that not only entertain your children, but teach them import virtues. I love the stories in these great books. They keep my attention. You are not going to get bored reading these stories. They have incredible detail, beautiful illustrations and a fabulous story line. Each book teaches a virtue using animals to keep your child’s attention. I highly recommend these for your own children or as a fantastic gift for any child you know. I can see these in a school or church library easily. Wonderful. Cloud9Kids™, a division of Cloud9World™, is dedicated to raising our children’s self esteem by teaching them values that will help them become happier kids and better human beings. The level of our children’s self esteem defines and shapes how well they are able to cope with the pressures of adolescence, and meet the challenges of adulthood. Our children’s self-esteem informs every aspect of their life from the quality of their relationships to his or her success in school. Building self-esteem acts like a magic spell that transforms the child’s life and guides them toward a brighter future. Want to keep up with all things Cloud 9 World? You can like em on Facebook, follow em on Twitter, and subscribe to their YouTube channel.